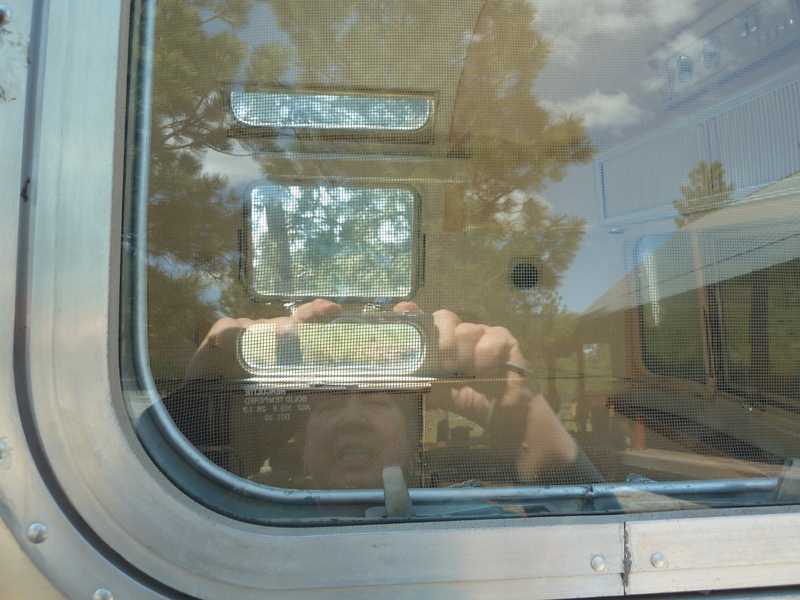 I think when I last wrote about our renovation work on the Airstream, we had just started cleaning up the windows. With spring coming on, we pulled it out of the carport and into the parking area near the house, hooked it up to electricity, and continued the work. We had some rain not long after we pulled it out, and this was a blessing in disguise, as we were able to locate and seal the spots where water was getting in (mainly around the VistaView skylights, the front window, and a place to the right of the door where someone had done a poor job of “repairing” the lower trim and had penetrated the wall into the main cabin). 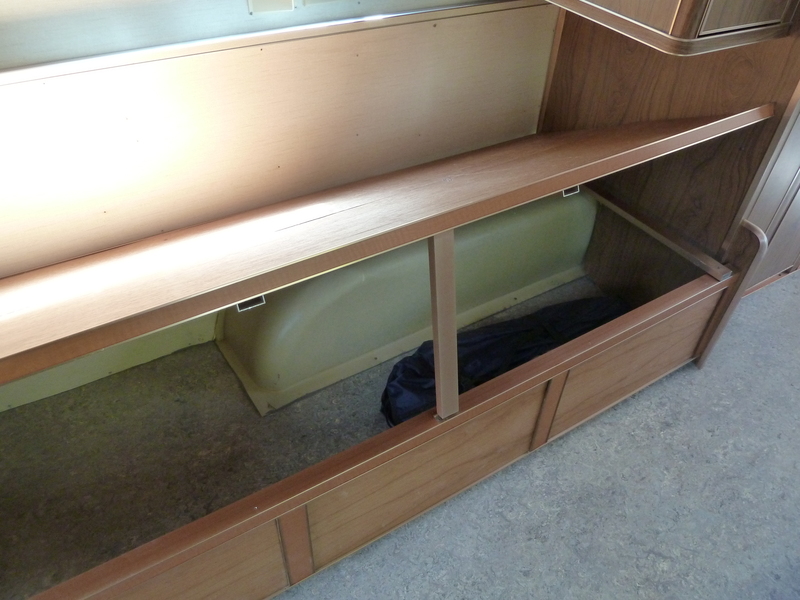 We knew there was leakage because there was obvious water damage to the subfloor in the front of the coach, and the old front sofa infrastructure and upholstery were all stained and mildewed. The new flooring (marmoleum, like old-fashioned linoleum) was scheduled for installation on April 25. 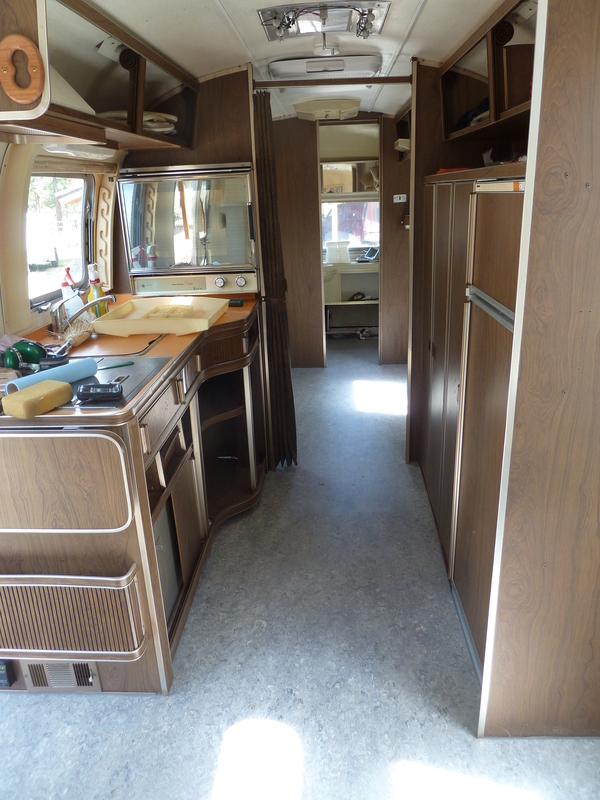 So we had to get the cabinetry for the front lounge and twin bunks out of there, plus the toilet, and clean before that happened. When Rick pulled out the bunk cabinets, we discovered large quantities of rodent droppings underneath. It was disgusting! So glad to get all that cleaned up. I also washed the walls down and washed all the screens. On the window front, it turned out all the inner panes were plexiglass. Rick managed to remove those inner panes from 5 windows that had the deteriorated UV film and we then cleaned up the outer panes (safety glass) using razor blades, solvent and lots of elbow grease. He also removed all the screens from those windows and I gave them a good scrub down. So here is the new flooring. It’s a blue gray with swirls of brown colors. The installer was grumbling about the tight quarters and difficulty, but he did an outstanding job! We had him run it under the bunks and the front lounge, too. 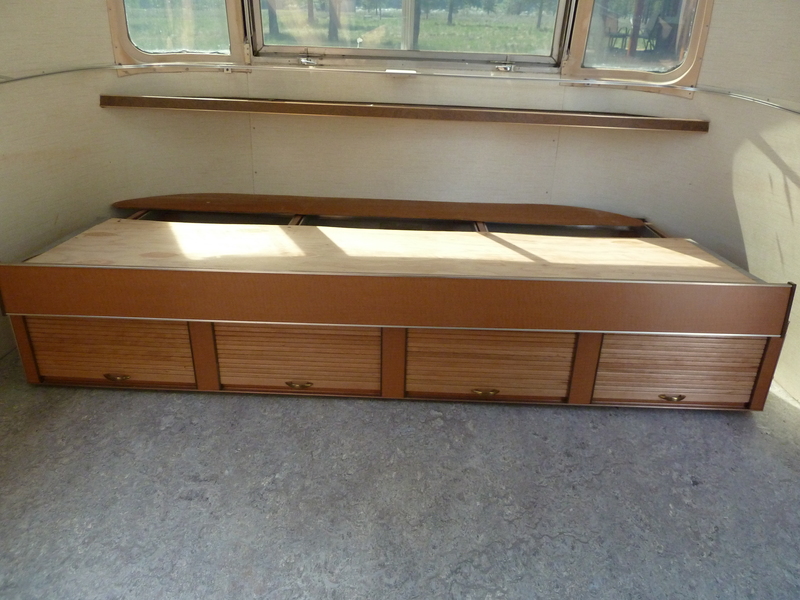 Most of the cabinets had tambour doors which have long since disintegrated. Tambour? Think roll-top desk. 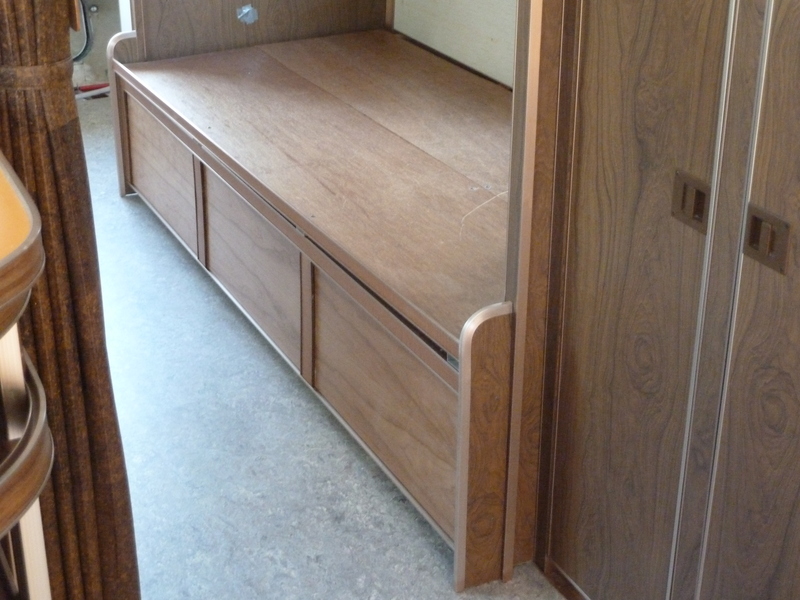 Rick also wants to upgrade the “look” of the cabinetry from dark walnut to cherry. He figured out that most of the cabinets are just frameworks with pieces of plastic laminate that can be pulled out and replaced. 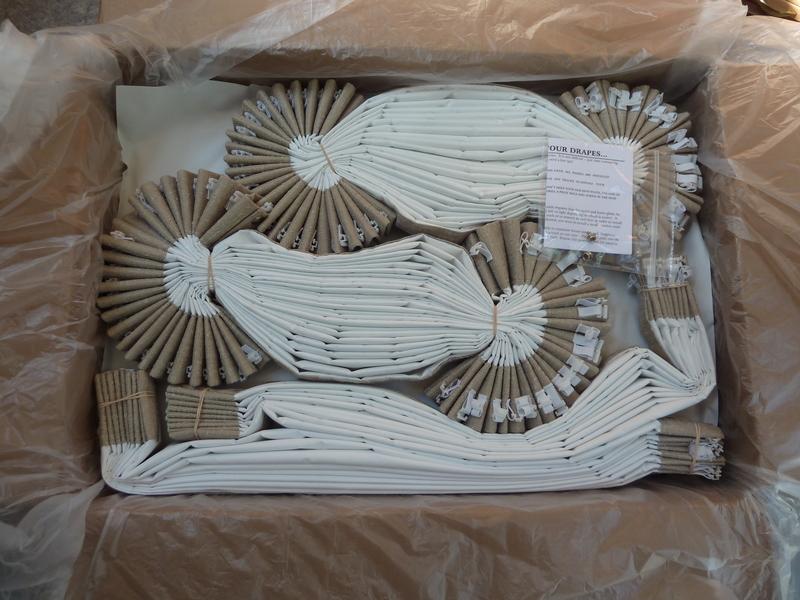 While he was on a wood-buying run to Specialty Forest Products south of Seattle, he picked up a 4′ x 8′ sheet of thin plastic laminate that is meant to be used on vertical surfaces. It is a wood grain pattern and color very close to the natural finish cherry he often works in. Then he figured out how to turn out the slats for new tambours and contact-glue them onto a lightweight canvas backing. Here are the new platform and storage areas for the front lounge. When I say “front lounge” this is the Airstream name for the unit that is a sofa usually, but can pull out into a double bed. The tambour doors cover storage areas that have brown plastic bins in them. 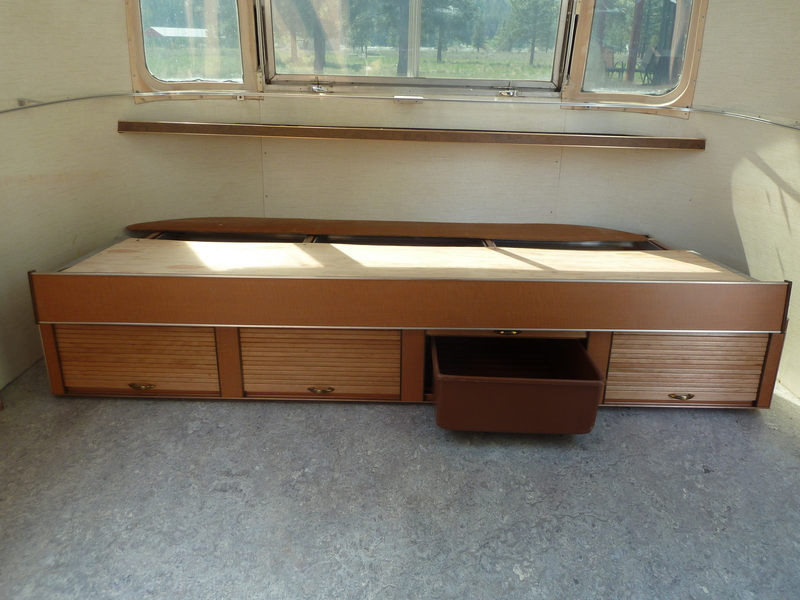 There are four under the front lounge, 3 under each bunk, and 2 wide ones over each bunk. He decided to do away with the tambours under one of the bunks, so we can just lift up the platform and store bigger things under there (folding chairs, tent, BBQ, etc.) So he just put flat cherry panels in the front of that bunk platform. Back to the windows. 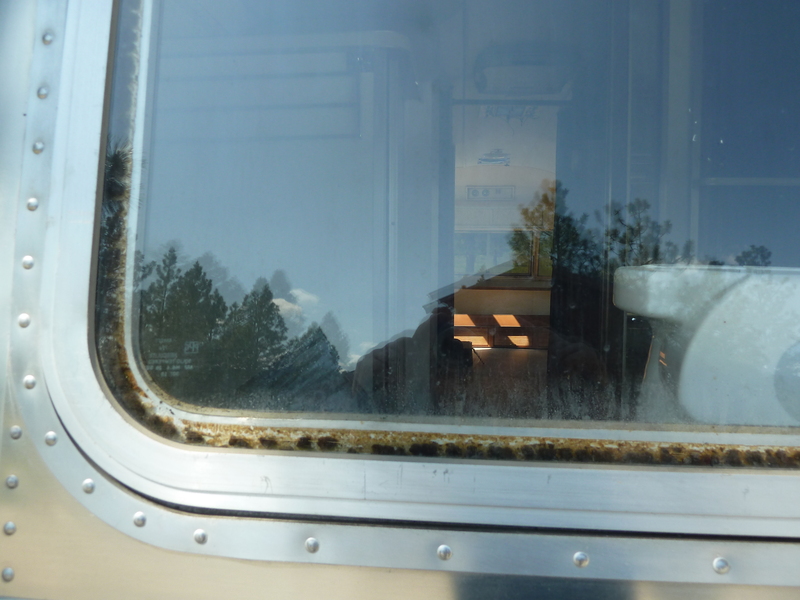 There had been strips of some kind of foam weatherstripping between the inner plexiglass and outer safety glass panes, and this was all disintegrated and ugly looking from the outside of the trailer. But it was also nearly impossible to get to, to scrape it off and clean it up. We were trying to stuff some new weatherstripping down into the space just to try to cover it up, but that wasn’t going so well either. Plus, we hadn’t removed the inner plexiglass from the large front and rear windows, so this stuff was trapped between the 2 panes and we had no way to get to them. Then yesterday we had both an “AHA!” and an “OOPS!” moment. All of a sudden we noticed the screws holding the frame of the plexiglass panel into the larger window frame. Went to work removing it from the small window next to the door, and away it came. So then we could get to the yucky weatherstrip residue and clean it off the outer safety glass using razor blades. But the “OOPS” is that we didn’t have to bust out the inner plexiglass panes after all. We could have just removed them IN THEIR FRAMES… clean up the crackled UV film on the outer pane, clean off and replaced the weatherstrip, and put the plexiglass inner panes back in. Arrgh. At least we can still do this on the large back window in the rear bathroom, and the large front window over the front lounge. So at this point, it is finish the other bunk platform with tambours, pull the plexiglass frames off and finish cleaning the windows, get the new fuzzy bug seal on the screens, and re-install the toilet and do some other cleanup in the bathroom. There was a slight hangup with the upholstery fabric (a dyelot issue not worth going into in detail, but I have to say I have received excellent customer service from Material Things in Wenatchee). The fabric should be here by the end of this week or early next, and then the cushions can be finished. I can hardly wait! 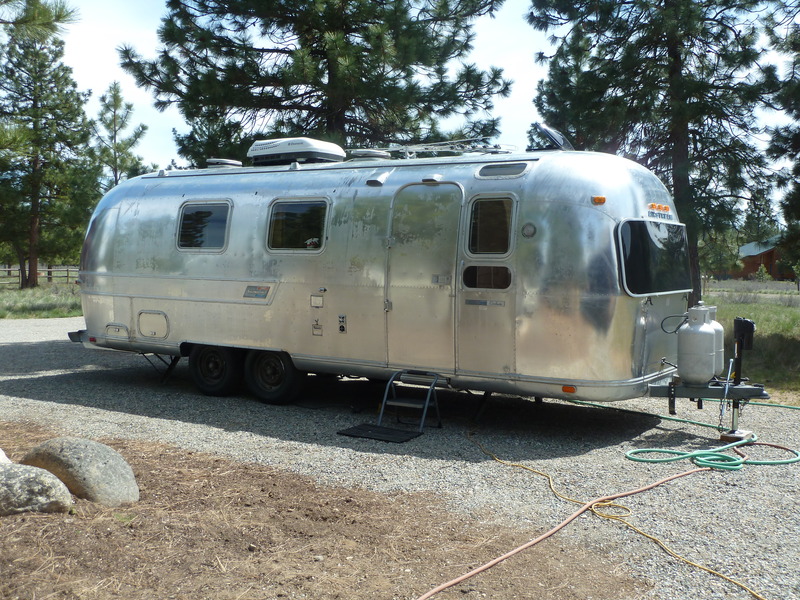 It will all come together before we take our first real trip to southern Oregon in mid-June. Yes, there is still lots to do (the kitchen cabinet, for one) but that will just have to wait until later this year, or even next year. Looks so good, coming together, can’t wait to see it in person. Hi. Working on a 1972 Land Yacht, and just used a dremmel tool to remove a Plexiglass inner window from a sun window up high. Still have a frame of Plexiglass to remove. How did your husband remove the inner Plexi? I don’t see a screw for these. I said to my hubby, “Wait, don’t remove the other one yet!” Looking good. Thanks for blogging. I am a new knitter, too, so will look a lot here. I’ve crocheted for decades. Hi Vanessa, we are without power just now after a big windstorm – I will try to get back to you directly in a few days. Sorry!